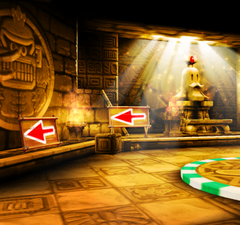 Bananan Ruins is a course in Mario Kart Arcade GP and Mario Kart Arcade GP 2. This course starts out in a jungle, the same area as in DK Jungle. After a sharp turn left, the player drives under an overhang, which leads to the area in the entrance of the ruins. The road leads the racers inside the ruins. After going up the stairs, players drive in a hairpin curve that takes them out of the ruins. The road takes place in a high area above the ground. Players then descend after the road into another ruins, which has a puddle of water that temporarily slows down racers. These ruins take the players into the jungle again, which is also part of the previous course. The hairpin curve there takes players back at the starting line. At the checkpoint/finish line Diddy Kong can be seen cheering for the players. In Round 4, like Round 3, rain occurs and different items are available for players. Omatsuri Circuit from Mario Kart Arcade GP DX contains the same course layout as Bananan Ruins. This page was last edited on February 26, 2019, at 11:40.